The non-consumable BOOK contains the inspirational short stories and lesson-by-lesson directions for completing the hands-on projects. 8½"x11" Black and white. Spiral-binding. 74 pgs. The full-color consumable PACKET consists of templates, artwork, and illustrated materials needed to complete the projects described in the Book. 8½"x11" Full color. Tear-off pad, shrink-wrapped. 82 pgs. 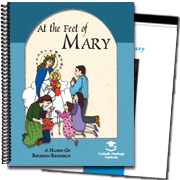 A family or group using At the Feet of Mary will only need to purchase one Book, while each student using the course will need his own Packet. Lessons are designed to be completed at a rate of one per week, for 21 weeks, but they can be accelerated to several lessons per week if need be.